Turn XML files into something more useful. This is the beginning of the menu.xml file for the online manual that comes with Scribus, to which I'm a contributor. Although you see blue text, they are not clickable links. I wanted to be able to view this in a regular browser, since sometimes I need to go back and forth from the canvas in Scribus to the manual to figure out how to do something (maybe to see if I need to edit the manual to straighten out some misinformation or to add some missing information). The way to help a browser know what to do with these XML tags is by using XSLT—Extensible Stylesheet Language Transformations. In a broad sense, you could use XSLT to transform XML to a variety of outputs, or even HTML to XML. Here I want to use it to present the XML tags to a browser as suitable HTML. 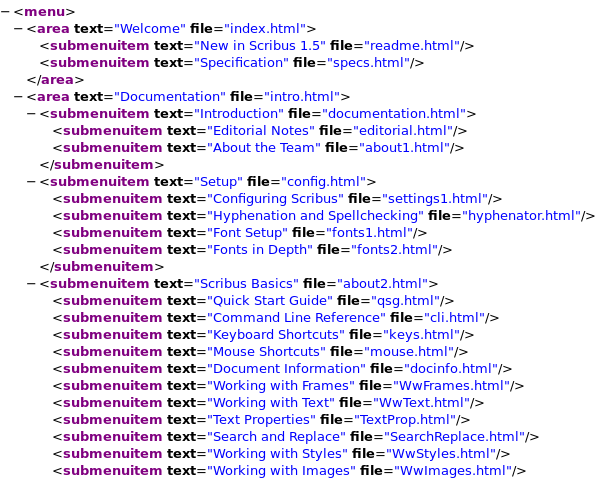 This looks a lot more like HTML, and you can see it contains a number of HTML tags. After some preliminary tags and some particulars about displaying H2, H3, and H4 tags, you see a Table tag. This adds a graphical heading at the top of the page and uses some images already in the documentation files. This minimal editing to menu.xml does not interfere with Scribus' ability to show the manual in its own browser. 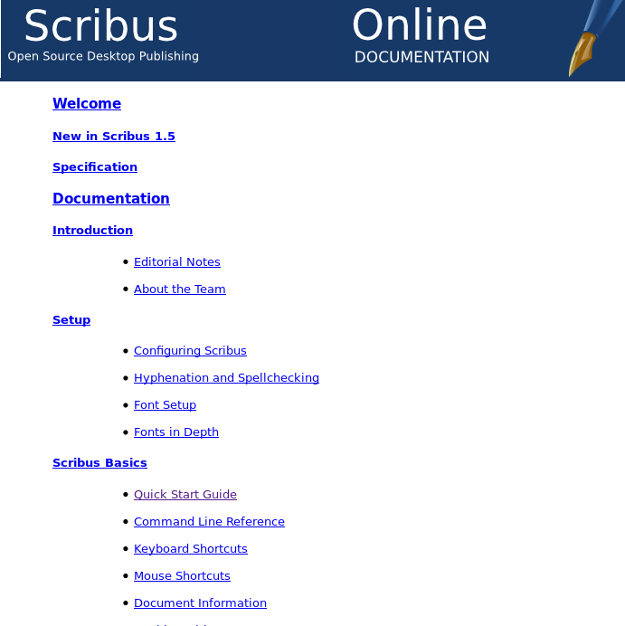 I put this modified menu.xml file and the scribus-manual.xsl in the English documentation folder for 1.5.x versions of Scribus, so anyone using these versions can simply point their browser to the menu.xml file and it should show up just like you see above. 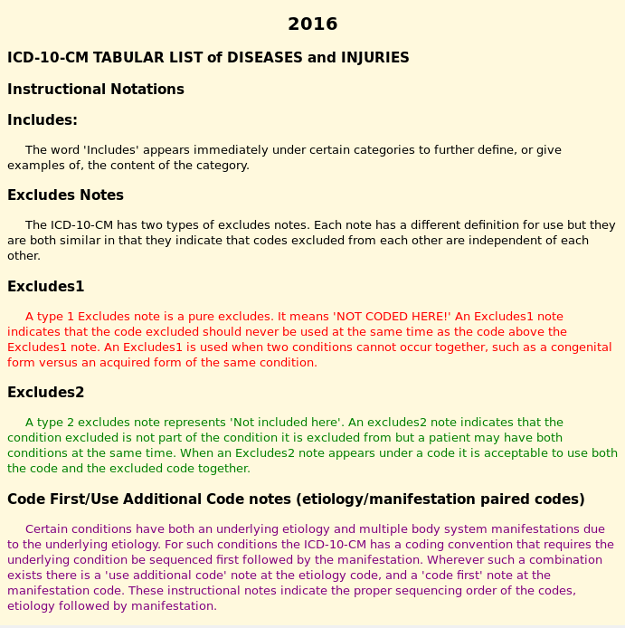 A much bigger chore I took on a few years ago was to create a version of the ICD10 (International Classification of Diseases, version 10) when it came out. Many changes were made from the previous version (ICD9) to 10. These are important since these codes must be used for diagnostic purposes in medical practice. 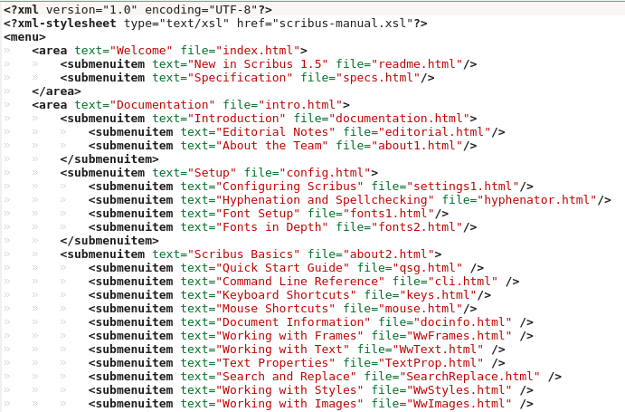 You can easily download XML files from the US Centers for Medicare and Medicaid website since it is public information, but—just as with the Scribus manual—these files are hard to use. As with menu.xml, the only editing I did in this Tabular.xml file was to add <?xml-stylesheet type="text/xsl" href="tabular.xsl"?> as the second line of the file. I started this project with the 2014 version, and I was quite pleased to find that the original tabular.xsl stylesheet worked perfectly when the 2016 version came out, which is the last one I worked on. The Tabular.xml file is 8.4MB, quite large for a plaintext file. It takes a few seconds to load into a browser, but once it's loaded, navigation is fast. While you may not often have to deal with an XML file in this way, if you do, I hope this article shows that your file can easily be turned into something much more usable. Excellent article, thanks! I often wish XSL was a lot more like CSS...but it isn't, so articles about XSL are always appreciated. One of the great things about XSL is that, once you get it right, the results are kind of magical. I have a large report (about 2,300 items with 10 columns each, a little over 38MB, comes out to about 446 pages) generated by a software package. I wrote several XSLT files to give me different views of the information. My problem is it that on the desktop it can be quite slow to load in FireFox, Edge and IE and doesn't work in Chrome or Opera. Cell phone or tablet browsers don't seem to like it at all. Any thoughts, pointers, resources, etc? I'm trying to keep it as simple as possible but could resort to tools such as JasperReports or write my own Java code to import, format and export to a pdf, html or other file that can be read both on a desktop or handheld device.